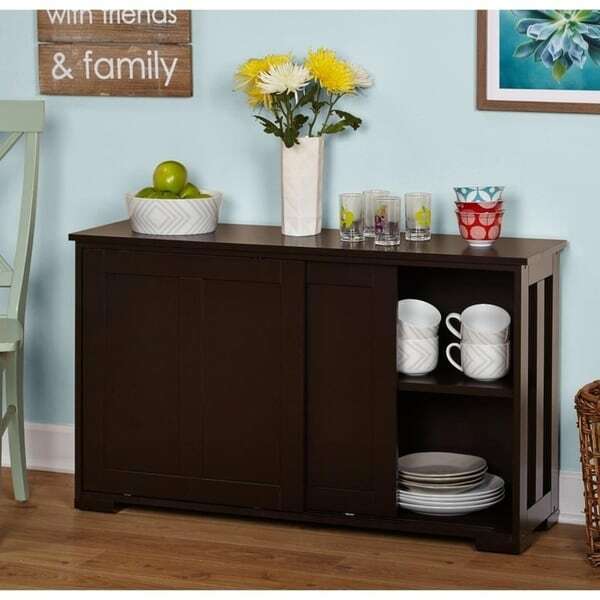 I bought this piece for a little extra storage in my breakfast nook and I love it! Plus, it was easy to put together. I love the idea that they are stackable!! I might have to grab another one! The perfect place to store your extra dishes and china, this Jefferson cabinet from Porch & Den will add convenience and style to your dining area. Crafted from engineered wood, the cabinet features two large, panel sliding doors and adjustable shelves that allow you to make use of tight spaces. The espresso finish cabinet features a versatile design that can be used as a high boy, or stacked with multiple cabinets to create a large cabinet. Please note: This item does not ship to Hawaii or Alaska. I purchased 3 of these sliding door cabinets (dark brown color)--one with wooden doors & 2 with the acrylic doors--to stack. These were VERY easy to assemble, with no missing parts, and simple to understand instructions. I never can understand when people rate things less bc they didn't read the description correctly, i.e., it's too small, or the doors aren't real glass, etc. It's all there in the description, so no surprises and I knew exactly what to expect!! What was really helpful were the reviews that described the inadequate pegs to rest the shelves on. I was able to fix that by purchasing spoon shaped pegs from the local hardware store, that would allow the shelves to rest on a flat peg surface rather than the rounded peg. Voila! The shelves don't move, and the pegs cost $1.80 for 12. As for the open sides, that is a non-issue since I am using these units as a pantry in my kitchen, so I'm not worried about my soup cans and grocery staples gathering dust. But I figured an easy way to fix that, if I wanted to, is to get plexiglass cut to size for above and below the shelves and stick them with craft glue dots. Again, a fairly easy and economic solution, which I don't mind absorbing bc I was able to get these cabinets for a great price! The cabinets look very attractive in my kitchen and have received many compliments on them! I am in love with this cabinet. I decided to purchase two stackables cabinets to create a china cabinet for my dinning room. 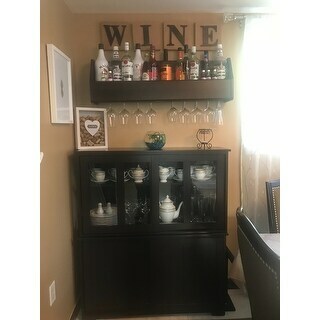 I combine it with a wine rack I previously purchased from overstock as well. And my beautiful dishes inside my new china cabinet I got them at overstock as well. Can you tell I love ordering from overstock? 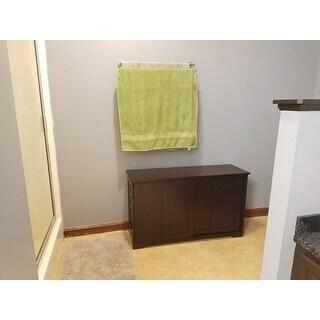 I recommend these cabinets there are easy to put together, I did both in 30 minutes. FYI In my picture it seems like they are color black but, they are not. There espresso color. Lovely. Pretty well built. However, some things are of concern and some bother me. First, I didn't know/realize that the cabinet has two openings on each side. The actual sides of the cabinets have one piece of wood in between in each side, which allows visitors to see what I am trying to hide to begin with. 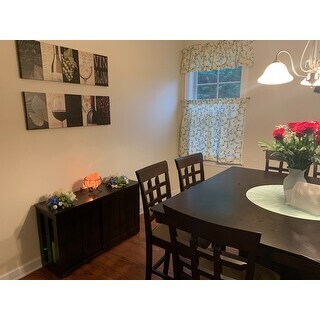 When I looked at the pictures prior to purchasing, I didn't see the opening. Maybe because the cabinets are very dark. When empty, they look as if the wood piece is a design to make it stand out. Like a purposely noticeable design. Secondly, the item indicates that is stackable. Well it is stackable, but as soon as I placed a few toiletries in the cabinet, the top cabinet tilted forward. The cabinet did not come with anchors to avoid this issue, but my husband added some anchors. I was worried about hurting somebody. My worry is due to the traffic that goes through this area (it is located between 2 bedrooms in front of a guest bathroom) and I don't want to have an accident. Third, I wanted to place foldable fabric cubes for storage but I couldn't because one of the sliding doors cannot be used when sliding. If the two doors slide to one side, the cubes do not fit. For all these reasons, I rated the cabinets a 3 on the scale. Assembly is easy. Problems occur when you stack the other components on top to make the "cabinet." I got this piece and the glass one to go on top. The glass one causes so much pressure on the one below, the sliding doors are hard to slide. There is 0 clearance between the shelf and the inner sliding door. This also makes it rough and difficult to slide. I am assuming with age this rubbing will wear out the shelf face and inner cabinet sliding door. Great cabinet for small spaces. Adjustable shelf makes it versatile. I bought two cabinets - fits together nicely. 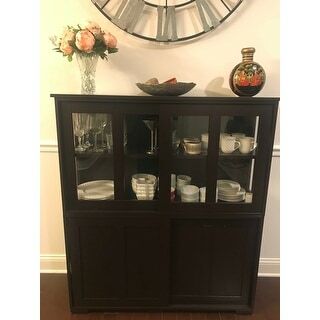 This is a great buffet for your dining room or a hutch if you add the glass door stackable display case to it. It is very easy to move - especially with a couple sliders underneath. Looks like it would cost 2-3x what it actually does - great value! Bought two of these to stack for my dining room. One with solid door and one with glass door. Have worked well for me. Use bottom one for storage - things I use but not necessarily want to display. Top cabinet with glass door used for displaying dishes. Sturdy and well made. Would recommend. Me n my 17yrs old son put together in less than 30 min, love that they are stackable. Bought two to give a straight line look under Tv on wall!! Didn't use the base feet as it would have been 1inch to tall.. Very pleased with this cabinet, it is really quite versatile. I had looked between several different cabinets and liked the style and price of this one, however it is was much smaller than I had envisioned at only 25" high. Quite pleased with the quality considering the price. Definitely recommend, just be aware of the dimensions! Bought this cabinet for extra storage in my kitchen. Seems like very nice quality and was easy to put together. All the parts were there and the holes lined up nicely. Doors slide easily and looks great! Not quite as wide as I had hoped but I would recommend. Love the product, it was easy to assemble. Only 4 ⭐️S because even having the dimensions, still a bit smaller then I would had hoped and very low to the ground. Very easy to put together. (Took me about 20/30 min)Very sturdy so far no problems. Love the color spot on from picture. This thing is so flimsy putting it together it started to crack, I had to glue all the joints and it's still wobbly. I don't see how you could stack anything on this it may fall apart. I would send it back but I don't want to deal with the hassle of shipping such a heavy item back. Nothing to rave about. Smaller then expected and not very sturdy . I purchased two of these (one with glass doors) to stack on top of the other. They are perfect and was very easy to assemble. Would highly recommend anyone interested in buying this cabinet. I'm using this in my bathroom that lacks any closet for storage. I love the look of the cabinet. I like the sliding doors. It was easy to put together by myself. Good value! This is fine for what I need. Doors don’t slide easily but looks nice if you don’t have to use it daily. Great for long term storage. I love this cabinet, easy to put together and it holds alot of stuff. Like the design, its slim and it doesn't stick out far from the wall. 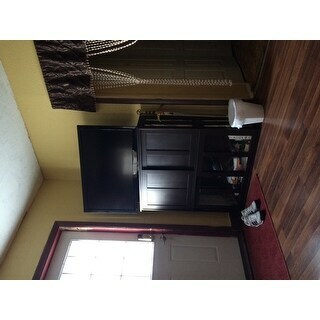 Great for a room that us small. I love this cabinet. I bought 2 and stacked them. They were easy to put together and very sturdy. However if there is any weight on top (microwave) it makes the doors not slide as easily. I love the color of this piece. It was easy to put together and look very attractive. The size was just right for my needs. It does not look cheap. The doors slide smoothly. Over all a good value for the price. This was just what I expected. Easy to put together. Cabinet is easy to move able to fit lots of materials in it , have had it for a while , no problems. "Are open slots present in all of these cabinets, only one picture is actually showing that and if sides are open , does manufacturer offer boards to cover the sides." Yes the open slots are in all cabinets. No the manufacturer does not offer boards to cover the sides. "Did any one had a problem with the shelf that came with this? It keeps falling. Also the inside sliding door on the same alignment as the little poeces that holds the shelf the door doesn't close all the way. Did I do something wrong? " "Is the interior shelf adjustable and is it one long shelf or is it divided?" The shelf is one long and is adjustable. "Does this have stained finish or a glue paper laminate fake finish?" "Hi can I put 10 in. Plates in it?" The inside cabinet dimension are 10.5 inches deep, so it would be little tight for the 10 inch plates. "Is this deep enough to hold a dinner plate? My plates measure about 10.5" across and that appears to be the dimension of the interior's depth. Just want to be sure they will fit. Thanks." It will be little difficult to fit in a 10.5” deep plate on the shelf. "how tall are two stacked together?" How to Set Up a China Cabinet from Overstock.com. Our guides provide customers with information about how to set up a china cabinet.